Conventional Buddhist tradition counts the beads at 108, signifying the mortal desires of mankind. The number is attributed to the Mokugenji (soapberry seed) Sutra wherein Shakyamuni Buddha instructed King Virudhaka to make such beads and recite the Three Jewels of Buddhism. In later years, various Buddhist sects would either retain the number of beads, or divide them into consecutive twos, fours, for brevity or informality. A decorative tassel is sometimes attached to the beads, flanked by talismans or amulets depending on one's local tradition. 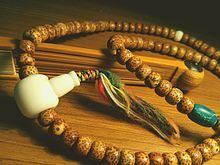 Because prayer beads are often painted in pigment, various traditional schools attribute a consecration ritual by the Sangha to the beads, to "open the eyes" for the purpose of achieving Enlightenment unique to the Karma of each believer. Pacifying mantras are often at recited using white colored malas. Materials such as crystal, pearl, shell/conch or nacre are preferable. These are said to purify the mind and clear away obstacles like illness, bad karma and mental disturbances. Using pearls is not practical however, as repeated use will destroy their iridescent layer. Most often, pearl malas are used for jewelry. Mantras to tame by forceful means should be recited using malas made of Rudraksha beads or bone. Reciting mantras with this kind of mala is said to tame others, but with the motivation to unselfishly help other sentient beings. Malas to tame by forceful means or subdue harmful energies, such as "extremely malicious spirits, or general afflictions", are made from rudraksha seeds, or even human bones, with 108 beads on the string. It is said that only a person that is motivated by great compassion for all beings, including those they try to tame, can do this. Mantras and chants are typically repeated hundreds or even thousands of times. The mala is used so that one can focus on the meaning or sound of the mantra rather than counting its repetitions. One repetition is usually said for each bead while turning the thumb clockwise around each bead, though some traditions or practices may call for counterclockwise motion or specific hand and finger usage. When arriving at the Guru bead, some[who?] assert that both Hindus and Tibetan Buddhists traditionally turn the mala around and then go back in the opposing direction. However, some teachers in the Tibetan traditions[who?] and beyond emphasize that this is superstitious and therefore not so important. This is an example of the double-ring onenju or nikka juzu used by the Jōdo-shū. This is a Japanese Buddhist prayer bead that has a picture of Kūkai inside the main bead. The text on the left and right is a common mantra devoted to Kūkai. ^ Watts, Jonathan; Tomatsu, Yoshiharu (2005). Traversing the Pure Land Path: A Lifetime of Encounters with Honen Shonin. Jodo Shu Press. ISBN 488363342X. ^ Buswell, Robert Jr; Lopez, Donald S. Jr., eds. (2013). Princeton Dictionary of Buddhism. Princeton, NJ: Princeton University Press. p. 520. ISBN 9780691157863.